Did stripped stars re-ionize the Universe? Mathieu Renzo, a PhD student at the University of Amsterdam. Today’s astrobite is a guest post, written by Mathieu Renzo. 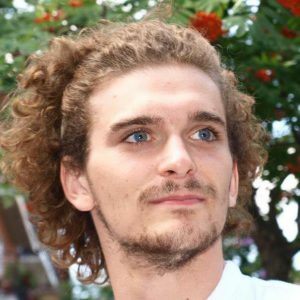 Matheiu is a third year PhD student at the University of Amsterdam, working on the evolution of massive stars in binaries using both population synthesis and structure models. He enjoys traveling, and takes advantage of all the opportunities to go anywhere that come with the PhD. One long standing puzzle about the evolution of the Universe is the epoch of reionization. After the recombination of electrons and protons that created the cosmic microwave background, the universe was opaque and light could not get through. But roughly ~500 million years after the Big Bang, something turned on and started producing ionizing radiation, causing protons and electrons to re-separate. This ended the “cosmic dark ages” and made the universe transparent again. It is generally believed that this “something” was the population of massive stars (although AGN are also considered). Most stars have a thick hydrogen-rich envelope, which absorbs the ionizing photons they produce, but stars more massive than ~30 solar masses can lose to stellar winds their entire hydrogen-rich envelope. By doing so, these stars reveal their hot helium-rich core and become Wolf-Rayet stars, which can release ionizing radiation. 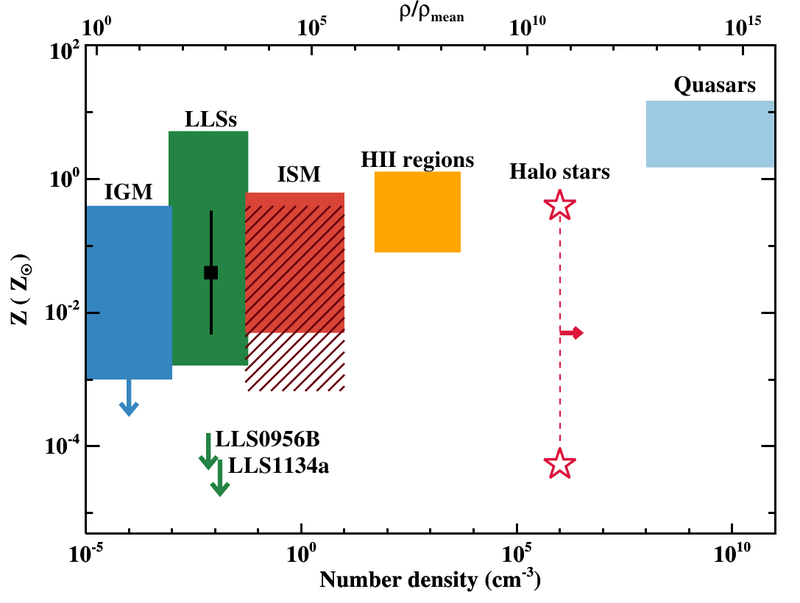 However, current estimates of the massive star populations in the early Universe can hardly produce enough ionizing photons from Wolf-Rayet stars to explain the epoch of re-ionization. In today’s paper, Götberg et al. propose another way to remove the ionizing-radiation-blocking envelope from stars: mass transfer in binaries. In the local universe, the vast majority of massive stars are in binaries. Interactions with a companion can change the properties of stars. In particular, it is expected that ~30% of massive stars will lose their hydrogen-rich envelope to their companion after the end of their main sequence phase, when they expand to become giants. By losing their envelope, these stars also expose their helium core, and become “stripped stars”. Stripped stars might have contributed or even dominated the epoch of re-ionization, if massive stars preferred to be in binaries also in the early universe. 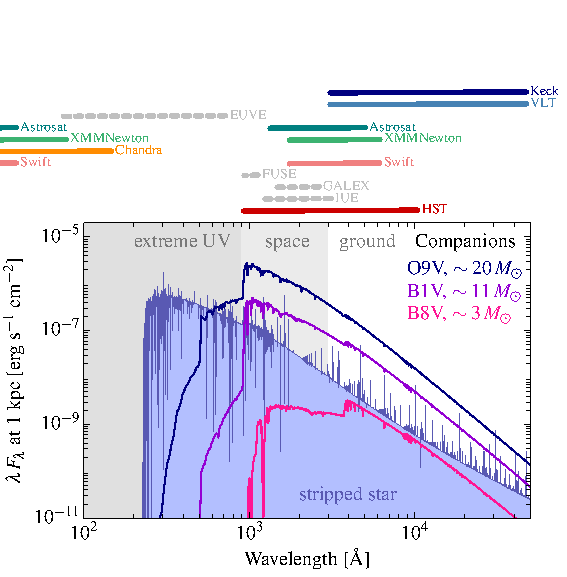 Figure 1: Evolution on the HR diagram of a single 12 solar mass star (A-B-C-gray track), and the same star in a binary (colored line, from A to H). The single star never enters the shaded region, where a significant amount of ionizing radiation is emitted. Instead, the binary donor spends all its core helium burning duration there, roughly 10% of its total lifetime. The binary mass transfer phase is marked by the black contour, and the color of the binary track indicates the core helium abundance: long live phases correspond to where the colors change faster. Source: Figure 2 from today’s paper. 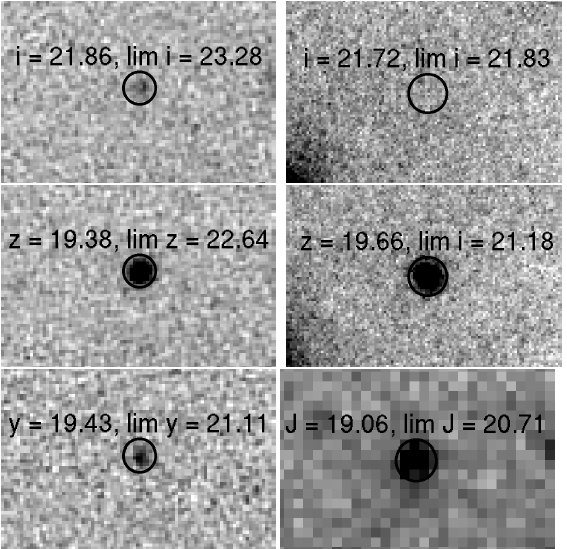 This paper presents an exploratory calculation of the evolution of massive stars in binaries, both their internal structure (c.f. Fig. 1), using a stellar evolution code, and the “look”, i.e. the spectrum (c.f. Fig. 2), using a radiative transfer code of the donor star in a representative example of a binary. They explore how both vary as a function of the metallicity of the stars, i.e.~the total amount of elements heavier than helium. As you look back in cosmic history, the metallicity tends to decrease, so stars in the early Universe had a much lower metallicity than the stars in our galaxy. They find that stripped stars at all metallicities can produce a significant amount of ionizing radiation. They do find that at lower metallicities a larger fraction of the hydrogen envelope is retained, but because of the high effective temperature achieved, that hydrogen is fully ionized, which means it does not block the ionizing radiation. Stripped stars can be much less massive than typical Wolf-Rayet stars, but still just as hot and ionizing. Therefore, because of binary interactions, stars that would never have provided ionizing radiation were they single, can emit up to ~80% of their flux in ionizing radiation (cf. Fig. 2). Moreover, because of their lower mass, these stripped stars live longer and can outnumber typical Wolf-Rayet stars. 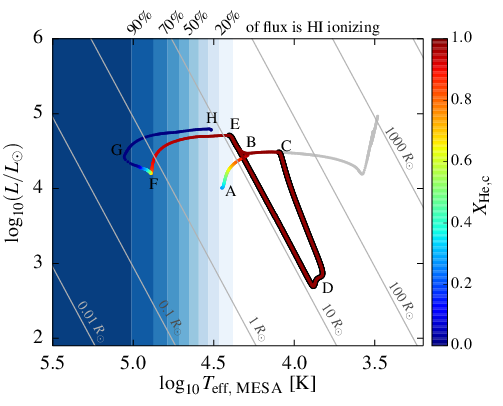 And finally, the stripped stars come later: the binary interaction removing the hydrogen envelope is delayed by the entire main sequence lifetime of the donor. This is helpful, because it leaves time for stellar winds and supernovae from nearby stars to clear the gas around the (soon to become) stripped star and make sure the ionizing photons are not blocked in its vicinity. Figure 2: Spectral energy distribution of a stripped star at solar metallicity (filled purple curve), with overplotted putative companions. Colored bars on the top indicate the spectral range accessible to present-day instruments, dashed gray bars indicate the spectral range of decommissioned instruments. Some spectral lines can be seen to outshine the continuum of companion in wavelengths accessible from the ground. Source: Figure 13 from today’s paper. So, in summary: Yes! The stripped stars are lower mass version of Wolf-Rayet stars, they can only be produced in binaries and they come later, are more numerous, and live longer than Wolf-Rayet stars. Because of all these effects combined, they might have had an important role in the beginning of the “age of enlightenment” of the universe. Where are these stripped stars? Despite the evolutionary channel leading to stripped stars being very common, very few of them have been unambiguously detected. This is because of severe observational biases, namely the binary companion outshining them, and the present lack of space-based instruments capable of looking at the (short) wavelengths at which these would be brighter than their companion (cf. Fig. 2). However, Götberg et al. suggest that specific emission lines (e.g., HeII 4686) might pierce through the continuum of the companion, which could be used as a diagnostic even using ground-based instruments. More work to identify these stars in the local universe is ongoing. Only once a significant sample is put together, will we be able to test the models in the local universe and extrapolate them back to the early universe to see if indeeed stripped stars could have ended the “cosmic dark ages”. It is important to disclose that Renzo is in the same research group as the paper authors. This is essentially just promotion of their work. Would an author be allowed to write an astrobites paper summary of their own work?